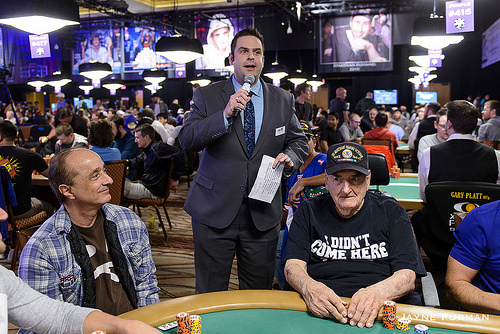 World War II veteran and oldest player in the WSOP Main Event field for the past three years, William Wachter, has been eliminated from the Main Event. Tablemate Adam Benowitz explained how Wachter was crippled when his set of fours came up against a straight, then he moved all in for his remaining 2,700 chips with . Benowitz had and called. The flop came , but the on the turn gave Benowitz the lead, and there was no help on the river. Last year Wachter cashed in 524th place for $19,500, but he won't be repeating that feat this year.